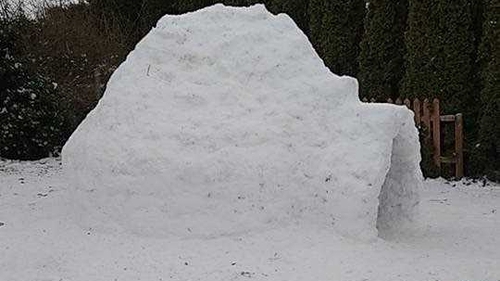 A group of 12 Meath teenagers spent seven hours building their own "Irish Igloo" during a "snow day" yesterday off school and college. All 12 members of the construction team can fit into the igloo, which was built as the country ground to a standstill with snow and icy conditions and sub-zero temperatures. Labelled "Teach Sneachta", pictures of the innovative structure on social media went viral with the Irish community in Toronto claiming that "a little bit of Canada has gone to Ireland". Others on social media questioned if some unscrupulous landlord had advertised the igloo on Daft.ie or myhome.ie property sites. Alison Walsh said: "We spent a total of seven hours building it. There were 12 of us doing it all day but we got help from a few younger kids who came in and helped us off and on." The film and Spanish student at Trinity College added: "Every time it snows I have wanted to do this and it has fallen through as I try to do it by myself. It was a group idea yesterday that building an igloo would be a lot more fun than building a snowman." Her friend Alannah Eager, a DCU business student, said: "We all came out with the intention of having a snowball fight but we got sidetracked for seven hours! "There was a lot of work in it and a few broken buckets. We had to use sleds for carrying the snow to the igloo. We got a wheelbarrow to carry the snow to the igloo as we ran out of snow and we cleared five driveways. "The little kids on the road came up and helped us for an hour and they brought their small little buckets and spades. "We had the tall ones working on the outside and the shorter ones working on the inside so it was a pretty good system." Simon O'Brien, a Leaving Cert student at St Peter's College in Dunboyne, said: "We started with the idea of a massive snowman and it progressed with the idea of a massive igloo. "The neighbours were happy with us clearing the driveways of snow." The arrival of the Storm Emma saw the roof of the igloo fall in overnight, but Ms Walsh joked: "After yesterday we are now looking into building a two-storey igloo. We are just drawing up the blueprints."